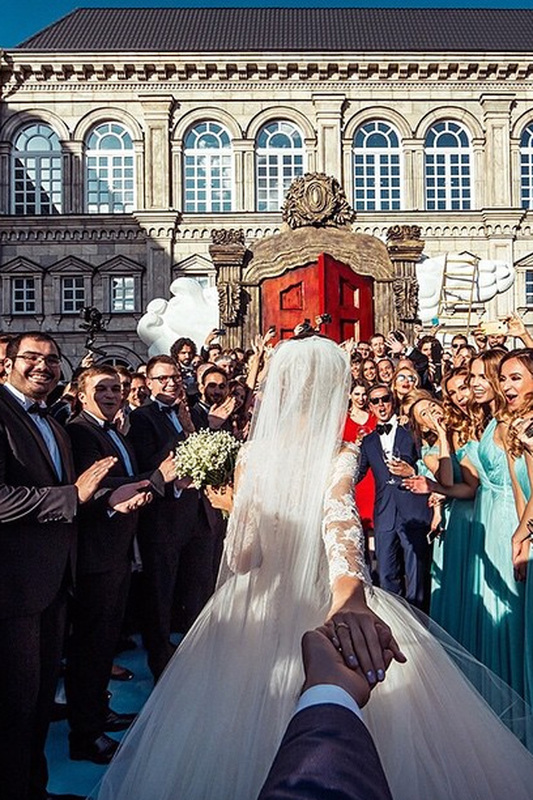 Is This Murad Osmann Instagram Picture The Most Amazing Wedding Photo Ever? Is This Instagram Picture The Most Amazing Wedding Photo Ever? #FollowMeTo couple Murad Osmann and Natalie Zakharova have shared a stunning shot from their big day. The Instagram couple who captivated the world with their #FollowMeTo pictures have married. And the wedding was insanely beautiful. Murad Osmann amassed his 2.6 million followers by sharing snaps of his partner Natalie Zakharova leading him around the world, so it’s no real surprise that he decided to break the news in the only way he knows. But as a slight break from tradition, the duo aren’t holding hands in the picture. ‘#followmeto the wedding with my love @yourleo,’ he captioned the image which sees him reaching out to Natalie as she walks down the aisle. While the groom’s outfit is hidden from view, the back of Natalie’s show-stopping Vera Wang gown is clear for all to see. The dramatic white dress features delicate lace detailing across the top of shoulders and a fabulously voluminous full skirt. The bride’s glossy hair is twisted into an intricate updo. Natalie also took to the social networking site to share a photo, prompting a number of fans to send kind congratulatory messages. With the elaborate door that wouldn’t look out of place in a Disney movie and golden flamingo statues, we certainly agree that it’s a ceremony fit for a princess. Murad – who’s travelled to places including America, Bali and Singapore with his love – even found opportunities to take sensational shots in the run up to the big day. ‘#followmeto the preparations for the wedding with @yourleo at our friend Antonio’s place @mastersuit,’ he wrote alongside a still of Natalie having a tailored jacket pinned in place.